In medium skillet, melt margarine over medium heat. Add onion; cook 4 to 5 minutes, stirring occasionally, until tender and lightly browned. Stir jelly into onion mixture. Cook 1 to 2 minutes longer, stirring occasionally, until golden brown. Meanwhile, spray 4- to 6-quart slow cooker with cooking spray. Place stuffing mix in slow cooker. Drizzle with water; mix gently. Sprinkle turkey breast half with salt and pepper. Place on stuffing mix. Spoon onion mixture over turkey; spread evenly. Cut turkey into slices. 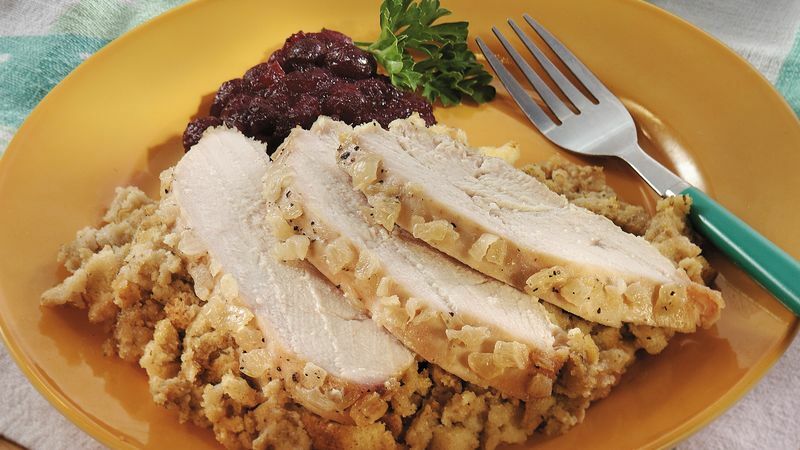 Serve stuffing topped with turkey slices.